Carolina Hills in Marshfield is a little known area with a lot of trails. The trails are hilly, sandy in a few places, and lots of fun. Park on Eames Way, just beyond the school, where the paved road turns to dirt. You’ll see a trail going into the woods. Take it and explore. There are quite a few singletracks on both sides of Eames Way and the power line. Some of the trails extend across Route 139. When I ride here I choose the trails that extend my downhills as much as possible while climbing hills quickly. After a few rides I found myself quite able to do that. You will too. Altogether there are probably 17 miles of trails. These include trails on town conservation land as well as on nearby New England Forestry Foundation land. Explore enough and you’ll even discover some well-maintained Boy Scout trails. There are two maps at the top of this page. 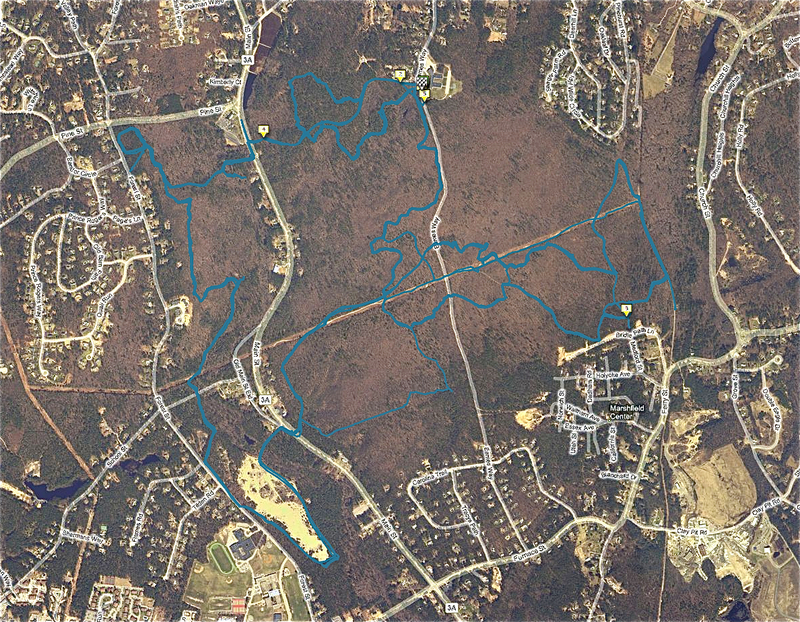 The first shows the trails in the 775 acre Carolina Hills Conservation Area. The second also shows many of the trails on surrounding land. Check out the Carolina Hills. If you do, I’m sure that you’ll return often.